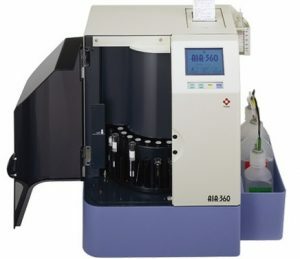 The AIA-360 Immunoassay Analyzer is a sophisticated immunoassay testing system that fits in any laboratory environment. The analyzer has a footprint of 16 X 16 X 21 inches and weighs approximately 61 lbs. Its compact design is ideal for physician office laboratories, work stations for small hospitals, STAT testing, such as cardiac panels, as well as a dedicated system for specialty testing. With a throughput of 36 tests per hour, the AIA-360 generates its first result in approximately 20 minutes. The cost effective system utilizes the same 10 minute incubation reagents as all Tosoh AIA Automated Immunoassay Analyzers, so results are consistent and interchangeable.